Everyone who knows me personally, knows that I have always been against electronics for my kids. I just think they are too young to have their eyes stuck to a screen. They should be playing outside, running around, using their imaginations. However, for Christmas Amazon was selling Kindles for $35, so the hubby and I jumped on the deal for the kids. They were a big hit on Christmas morning. I couldn't help but give in and want to be the cool mom for once. This day in age almost everyone has some sort of electronic gadget. It's very rare when I meet someone who doesn't have a smartphone or tablet. They thought they were the coolest kids with their hip new gadgets! Whenever they used them it freed up time for me. I could cook, clean, tend to the baby, have a thought peacefully. 😊 It was great!.... Until it wasn't. I started noticing a change in behavior in Eli the most. He was grouchy, cried A LOT, always fighting with Abram, just had an awful attitude. Same with Abram. He was snappy, cranky, emotional, and fought with Eli about everything. As punishment they would lose tablet privileges. I noticed without their tablet they were calmer not as cranky and hardly fought. There was no snappy answers from Abram and Eli stopped crying so much. This wasn't some small details. These were noticeable dramatic changes. Luis noticed them too. So I conducted a little experiment. I told them no electronics for a week, including the XBOX my sister had given us, which rarely got used anyway. I also limited their television to 2 hours or less a day. We did projects, arts and crafts, played board games, went for long walks, got dirty, and had fun! On one of those days I also stopped using my phone. I logged off of all my social media, that way I wouldn't be tempted to check any notifications. The results of my little experiment was very shocking. That week their behavior was so much better. They played and got along a whole lot better. They fell asleep within 10 minutes of laying down. They were happier kids! The day I didn't use my phone I felt a lot different at the end of the day as well. I felt less mind boggled. Less overwhelmed. Honestly, I was even in a better mood myself. It was 8pm and I wasn't trying to rush them off to bed. Normally by 7pm I'm ready for them to go to bed so I can relax and distress. That day I lost track of time. I shared my little experiment with a friend of mine who said her daughter's IPad had broken and since she was not using it she also noticed her daughter having a better attitude. I allowed the boys to play on the XBOX yesterday after Abram got home from school and told me he had gotten a little reward for helping in class. They played for an hour. At the end of the night they were not following orders to clean up and get ready for bed. It took Abram nearly 2 hours to fall asleep! With that I concluded that electronics are ok to use sparingly. I would rather have a happy chipper child than a cranky tired child who can't turn his brain off. It's so important for kids to have that opportunity to actually be kids. To use their imaginations and creativity. I know society tells us that apps and programs help develop a child's brain, but the reality is there were no apps and tablets when Albert Einstein was a kid. I'm no doctor, but I am a mother who pays close attention to her children. If you are noticing your child has a difficult attitude, emotional outburst for every little thing, fighting frequently or having a tough time falling asleep, try taking away their electronics for a few days. You just might notice a positive change. Share your thoughts in the comments below, I would love to know if you have tried this before! I really enjoyed reading about the results of your experiment! I've also noticed influences on Elliot and he isn't really that interested in TV or iPad. Sometimes I would click a learning type video through YouTube for him to watch but he quickly learned how to click the suggested videos on the side and we removed YouTube from the iPad because even though there wasn't anything too terrible, he would mimic some of the behaviors and did seem more aggressive. Same thing with tv shows...I'm super careful what he watches because he is a sponge for how characters talk/act. Totally agree! Have you read "Growing up Social" by Arlene Pelicane? It covers this topic in a really great way and provides a lot of science to back up why screens aren't great for kiddos. I haven't read that. I'm intrigued! I will have to pick it up. Thanks so much for reading! Well I hope the people doing these studies figure it out soon. I just feel for the parents who can't tell or don't know what's wrong. Technology will either make us or break us. Thanks for reading! You are BEYOND smart to do this! Kids these days are 100% saturated with ELECTRONICS... They don't even know what "play outside" means...... Unless you're talking about playing your PSP or something outside! Haha right?! I try to encourage outdoor play everyday, if the weather cooperates. Thanks so much for stopping by! We limit more with my 8 year old than my 3 year old. 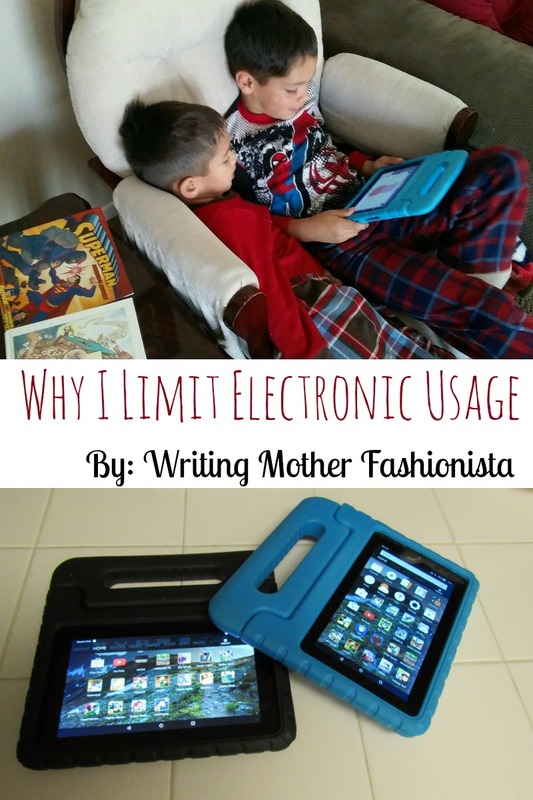 But now that he's starting to get more tech savvy -- I need to implement limits with him. He loves YouTube kids right now. Isn't it so funny how they understand technology at such an early age!? Thanks for stopping by! At my high school graduation dinner (at a really nice restaurant), we were seated next to a family with two kids who were playing games on their iPads on full volume! I think more parents need to do what you're doing, it's better to be present than to be behind by a screen! Also, your kids are adorable! Yes! I couldn't let my kids do that. How rude! Thank you for stopping by!